How would gravity work? Would we still have time zones? Change of seasons? Would the conditions for life here on Earth exist at all? Most early theories on the shape of the Earth were based on religious interpretations. But what about modern day believers in a non-round Earth? Some belief in a hypothetical Flat Earth continues to the modern day. Samuel Shenton established the Flat Earth Society in 1956, right around the beginning of the Space Race. While this iteration was less religious than previous or succeeding flat earth groups, Shenton did believe that Earth appeared round in photographs because of wide-lens cameras. 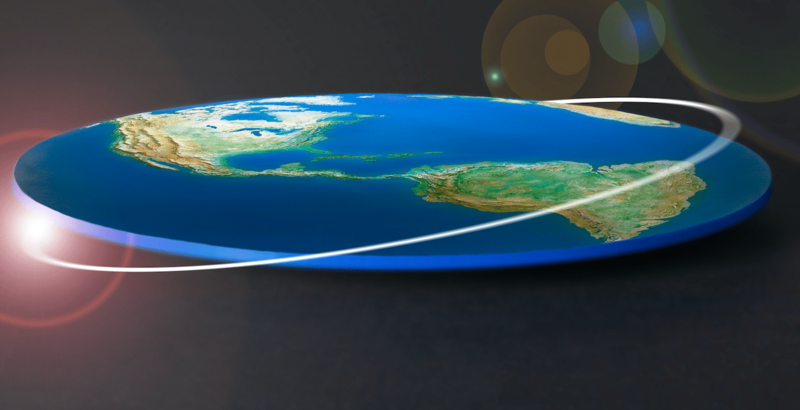 Today’s Flat Earth Society theorizes that the Earth is shaped like a disk, with the North Pole being located at the center and Antarctica being located around its edges. This theory is primarily based on interpretations of the Christian Bible. The first to popularize these theories was the 1865 book “Zetetic Astronomy: Earth Not a Globe,” by a man named Samuel Rowbotham. Is this what the edge of a flat Earth looks like? Modern day flat earth theorists believe that Earth’s gravity is actually an illusion driven by dark energy. They believe that day-night cycles are driven by the Sun and Moon, which they believe are 32-kilometer long spheres, rotating in circles and illuminating different parts of the planet. Flat earth theories also often overlap with other, shall we say, fringe theories, such as the theory that the moon landing was fake. To this day, flat earthers believe that people who believe in a round Earth are the ones who are misinterpreting facts. After the solar eclipse of 2017, many flat earth adherents made videos using footage of the event to prove that the earth is flat. Additionally, many modern day Flat Earthers believe that they have been lied to by the media on many topics, and the Earth actually being flat, rather than round, is simply a symbol of a larger issue. Flat Earthers often believe that others believe on a round Earth simply because they have not been shown the facts proving that the Earth is, in fact, flat. First of all, forget about walking to its edge. Gravity would simply not let you. Wait, would gravity even be possible on a flat Earth? The answer is yes, of course. The force of gravity is what keeps our planet, or any other planet, together. It’s what forms a planet in the first place. In the case of a pancake-shaped Earth, the force of gravity would pull you to the center, and would become stronger as you tried to walk away from it, pulling the top of your body backwards. It would feel as if you were climbing a hill that was getting steeper, and steeper, and steeper… By the time you reached the edge, ‘down’ and ‘behind you’ would become the same direction. Sound weird? Gravity would pull everything to the center of the disk. How about water being sucked to the center of the Earth? Or diagonal trees, growing in the opposite direction of gravity’s pull? And then there’s the sun. How would a flat Earth behave in space? One flat Earth theory is that the Sun revolves around the Earth… Not the other way around. What if the Sun orbited the Earth just like the moon does? In that case, you would never suffer jet lag, as there would be no such thing as time zones. The sun would light up both the top and bottom of the planet. This would mean constant light, no day-and-night cycle. Also no seasons. Or solar eclipses. The sun itself would have to be much smaller. Otherwise it would burn the Earth to a crisp. It would probably fry the planet anyway, as there would be no geomagnetic field to protect the Earth from its radiation. The geomagnetic field is generated in the solid core of the Earth, and keeps our atmosphere from escaping. Without it, cosmic rays would bombard our bodies, causing everything from cancer to DNA damage. The oceans would escape into space, and so would the air, and all our oxygen. But let’s assume that a flat Earth had an alternative to our magnetic field. This way you’d still be alive to notice some strange flat Earth-effects. Like your shadow. Say you had a friend just as tall as you, and they lived a thousand miles away. On a sunny day, your shadows would be the very same length. Because, unlike here on a spherical Earth, the sun’s rays would hit both of you at the same angle. And if you two were to meet up, traveling would turn out very different. A “flat-Earth” map drawn by Orlando Ferguson in 1893. Let’s take a map introduced by the Flat Earth Society. Yes, the one that shows the Arctic at the center, and Antarctica as an “ice wall” around the edges. In such a world, it would take you 32 hours to fly from Australia to some parts of South America. Did we mention there’d be no GPS? Satellites wouldn’t be able to orbit a flat Earth, leaving humanity with no navigation, and no synchronized time. This means no ATMs, no credit cards, and no high-speed market transactions. On the bright side, with a good pair of binoculars you could see Dubai’s Burj Khalifa from any part of the flat world. But let’s be honest: you don’t need to build your own rocket to see the Earth is not flat.